Comfort Cover is a re-usable specially designed flexible plastic lip bumper shield that snaps securely into place on your orthodontic brackets, and totally covers your braces from end to end. It provides hours and hours of pain relief caused by irritation from orthodontic brackets and wires. This handy lip protector product can be especially helpful to musicians, public speakers, and "braces newbies" who want a little extra help in those first uncomfortable weeks of orthodontic treatment. You can also wear Comfort Covers for light contact sports (like wrestling practice) where mouthguards are not needed, or in intimate situations where you want protection from oral laceration. 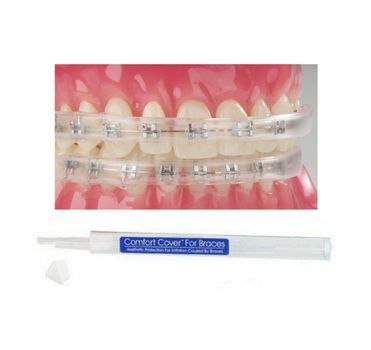 This product works best on smaller brackets and arch wires that are relatively straight, horizontally (may pop off of brackets that are very crooked across the teeth). Each Comfort Cover set contains two clear Covers, housed in a convenient plastic tube for easy transport. Just put your Comfort Cover set in your purse, backpack, or briefcase and go! The Covers are 5 inches long. Trim them with scissors for a custom fit. Caution: may present a choking hazard if used while sleeping. Please note: this product is not returnable due to health regulations. Each Comfort Cover set contains two Covers (one for the top teeth and one for the bottom teeth), a plastic carrying/storage tube, and instructions behind the label. Buy two sets and save! Looking for a cover for larger ceramic braces? Try our new Cover for Ceramic Brackets! Please note: Lip protector products are not returnable due to health regulations. You get 2 Comfort Covers (one for the upper teeth and one for the lower teeth). Comfort Covers can be trimmed with scissors for an individual fit. Includes a plastic storage tube. Comfort Cover is one of our best-selling products. Braces can really tear up the inside of your mouth, and Comfort Cover provides a long lasting barrier between your brackets and your gums! The only drawback of this product is that it may pop off if your brackets aren't relatively straight. Some people aren't sure whether to buy the Comfort Cover, Ceramic Bracket Cover, or Lip Protector. These products aren't expensive, so you can buy one of each and see which one works best for you. We have a "2 for" price on these products to save you a little money when ordering more than one product in this category. Can these be used for soccer? Instead of a mounth guard? Jessica, The Comfort Covers will not protect the skull or brain from impact injury in a high-impact sport like Soccer. It would be better to wear a protective mouth guard for braces, such as those made by Shock Doctor. When in doubt, please ask your team coach or your orthodontist or dentist. Can you eat foods such as popcorn or caramel with them? How do you clean these ?? You can wash them with antibacterial soap and water (rinse well afterward), or soak them in a retainer cleaner like Retainer Brite, DentaSoak, or Steraligner. Will these work for musicians ? Great question Allie! Although Comfort Cover wasn't made specifically for wind/horn musicians, it could work in that capacity. Every musician has different technique and of course the instruments are different, so everyone's results may vary in that respect. Great question, Allie! Yes, you can reuse them many times, as long as you take good care of them and clean them regularly. We recommend Retainer Brite to clean them. How many Comfort Covers come in a set? Do you get one for the top and one for the bottom? You get two Comfort Covers per set: one for your top teeth and one for your bottom teeth. They are great and easy to put on, they don't cause any pain and you can't even feel that you are wearing them. I purchased these as a possible solution for playing my French horn. While these are easy to attach to my braces and were comfortable to wear, they are too thick for playing French horn. Proscomfortable, easy to attach and cut to size. ConsToo thick for playing a French horn, unable to adjust embouchure (sp.) for playing. Easy to use. My only complaint is that it didn't fit over the brackets that have the knob for rubber bands. We had to kind of skip those ones. Otherwise great product. I bought these for my son who is a wrestler and just got braces. He said they work great. The only thing he didn't like was that he has one tooth that has a bracket that sits a bit higher than the rest so it was hard to get it onto that tooth at first. I haven't heard any complaints since so it must have worked out okay for him though. ConsWish it was a little more flexible to get on brackets that are not quite in alignment with the other ones. Great low price and came fast in the mail. My teeth are very crooked and I just got my braces on. But I was able to cut one of the strips into 4 pieces and I wear them on the upper and lower teeth on the side of my mouth which works great for me at night. I sleep on my side a lot and my cheeks press against the pillow so the guards keep my braces from digging into my cheeks and waking up with my mouth all cut up. ProsWas able to cut one of the strips in 4 pieces so I could wear them on the side of upper and bottom teeth at night to get relief. ConsWont fit all the way around on my teeth because my teeth are very crooked, but the website says your teeth need to be somewhat aliened. This product is wonderful. Wearing the brace prevented my child from getting sores in her mouth from her new braces. She wear the protective cover during basketball to protect her braces it is light and not as thick as the sport mouthpiece that made it hard for her to talk. It did provide a nice shield between by braces and lips but it was way too thick. I looked like a chipmunk. There is no way I could wear it in public. If you want something to wear at night it would be o.k. But not what I thought it would be, too bulky. I wore a mouthguard prior to braces. This is the only thing that still makes it comfortable for me to sleep. Great product easier to wear then a night guard and I certainly don't understand what I was doing before had them. I can't clench grind or mess up my bite using this product . Merchant Response:We're glad that this product helps you, but it's not meant to help with clenching or grinding. It's only meant to help protect the inside of your mouth from your braces. Dental brace cover does what it says. The moment you put on the cover over the brackets, you are relieved of all discomfort. Further refinement is required however. It's a plastic cover that covers your brackets. Can it be of thinner more pliable plastic? When you put the cover on you feel the durability like a mouth piece. I wish the cover was thinner which may make it breakable but it will be bulky once in your mouth. And you can add more replacement strips in the package. I wear these at night to protect my lips while I sleep. Very effective! Makes life with braces so much easier! Great device. Had been having trouble with braces scraping top lip. Cut guard to size, easy insert, no more irritation! Both ridiculously simple and brilliant. Makes my braces much more tolerable. Why did no one think of this before? Even my orthodontist didn't know about them. So long as you are wearing metal, it will greatly improve your life and mood. ProsSlips on easily and holds all night. ConsInitially the ends may not hold but after they are in your mouth a while, they assume the curve or your teeth and stay tight. If the inside of your mouth is torn and sore from traditional braces, these comfort covers are what you need. They snap on easily and provide your mouth relief from pokes and tears. For the cost, they're well worth trying. They do need to be cleaned daily. ProsNo more pain in my cheeks and lips. ConsThey do need to be removed while eating and thoroughly cleaned daily. However, the comfort is well worth the cleaning! My wife got her braces about a week ago, and the Comfort Covers have been a godsend for preventing irritation. She went without them the first two days and the inside of her mouth got really irritated. I suggested she try the Comfort Covers and boom! Complete change. The smoothness of the covers versus the brackets makes a world of difference and really helps prevent sores and irritation. Her teeth aren't terribly crooked - her braces are for bite correction and gaps - so the covers go on easily and stay in place very securely. She does have one premolar that needs to rotate quite a bit, and so the cover doesn't really stick on that bracket, but all the others are fine. In all, an excellent product, and we plan to buy more. These do a great job covering the braces. They are easy to snap on and are very comfortable except for the tiny fact that saliva accumulates inside and they make it hard to talk properly, but hey, for an occassional comfort, it is well worth it! ProsComfortable and easy to snap on. ConsCollects saliva and makes it hard to talk properly. Alot more comfortable than a bulky mouthpiece! My son was using those big bulky mouth guards for wrestling. They work horribly after you've had your nose bloodied and have to have the plugs in your nostrils. No way to breathe!!! These were a fantastic solution. He can now concentrate on his pinning instead of worrying about suffocating. Now the trick is to convince all of the referees & coaches in our league that these are sufficient, practical and just as protective as the bulky ones! Works great to keep braces and wires from irritating lips and inside of mouth. I get cankor sores and this can be cut to fit a specific area to help with comfort and faster healing. My son said this worked great and every time his wires were irritating he wore the comfort covers. Will definitely purchase again if necessary. ProsEasy to use, can remove and re-use. ConsOnly con is shipping is the price of the item. My daughter plays French Horn.She was unable to play and hold notes due to discomfort with her braces. After she tried playing with the Comfort Cover I now have a Happy Child once again. ConsHaving to cut to fit. I really love this product! My mouth was hurting from braces and this really helped! ConsTakes a little getting used to. Easy to use and prevents pain in my grandaughter's mouth. Conschanges the quality of speech somewhat. This product really does work , and helps prevent cutting your lips! Great alternative to a bulky mouth guard that we were given by the orthodontist! I bought this product after getting my top set of braces. I didn't use them for the top set because they didn't fit quite right and felt very bulky in my mouth. This past week I got my bottom set of braces put on and OH MY CHEEKS! I was willing to try just about ANYTHING to stop the pain of the back bracket digging into my cheeks and the sharp brackets cutting my tongue. The first night I tried the comfort cover it was too tight and hurt. After a few days though the pain subsided and the comfort cover is now my best friend! It does still feel kind of bulky but I don't care! It helps keep the brackets away from my cheeks and my tongue so the sores can heal. Wax just wasn't working because it wouldn't stay stuck on the back brackets and would just slip off, the comfort cover works like a charm. I highly recommend this product. It may not fit perfectly if your braces aren't very straight, but when it fits correctly it works like a charm. ProsAbsolutely reduces pain from sharp brackets! This product does none of the things it claims. I have acrylic top braces and metal bottom braces. I got these for the metal braces, as they are not recommended for acrylic. What I received is two tube-like lengths of plastic, intended to clip on over the braces; no instructions or product information whatsoever. The problem is, (unlike the photo of the mouth model shown with the product on the site) the plastic length of tube isn't pliable or bendable to fit around the curve of my mouth/teeth it snaps on fine in the middle, but as I try to continue snapping it around to the back it breaks open, making it impossible to snap on (even though my braces and teeth are pretty even). This was a frustrating waste of money; and because of how it is packaged it is non-returnable. I advise not to waste your money on this product. Very disappointing. Merchant Response:These sort of lip protectors work best if your brackets are straight across your teeth (straight as opposed to zig-zag). Sometimes they do pop off if your brackets are not straight enough. However, during the course of treatment, as things begin to straighten out, they will work better. This product is very popular with kids who use them for light sports and wrestling practice. As with any product, everyone's needs are different, and results may vary.